Who among us hasn't been uncomfortable in our own skin at some point in life? Who among us hasn't wondered about our own worth, wishing to be something we were not? Well, Victor, or Víctor, follows the innocent but impossible dreams and adventures of a young vulture who, through experience and the support of his family and community, finds his own self-worth. While written for intermediate readers (ages 8 to 12 or so), young and old alike will find this delightfully illustrated story humorous, touching, and meaningful. 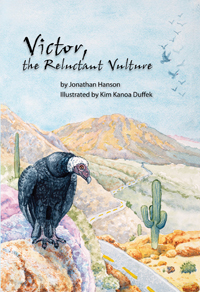 Along the way, they will learn about some of the unique characteristics of not only vultures, but of some common birds of prey in the Sonoran Desert. And that's just the story! For the older intermediate readers, as well as for teachers and parents, the book includes brief entries on the natural history of animals or plants featured in Victor's tale. So, treat your favorite young naturalists to the Desert Museum's Victor, the Reluctant Vulture or Víctor, el zopilote renuente. "Learning who we are is not only children's work, but a lifelong process of self-discovery. Victor's engaging tale will not only encourage our youth to reconsider how they see themselves, it will also encourage them to consider their appreciation of wild creatures that are often not kindly looked upon. In addition, young readers will pick up many fascinating details about the Sonoran Desert, both in the story and in the accompanying natural history materials. Although this is a children's tale, the accuracy of biological information in it sets a high standard." "Vultures keep the world clean, diverse, and lively. Jonathan Hanson has perfectly captured their character in this book. Because of this story, I want to be a vulture when I grow up." Jonathan Hanson and his wife, Roseann, have written several natural history books together, including the Southern Arizona Nature Almanac and 50 Common Reptiles and Amphibians of the Southwest. They live in a tiny solar and wind-powered cottage in the middle of the Sonoran Desert. They count among their neighbors coyotes, deer, mountain lions, foxes, and lots of birds — including, of course, turkey vultures. Kim Duffek's interest in art and nature began at a young age. When she wandered home from a day of playing in the Midwestern tallgrass prairie, where she grew up, her mother would often put a paintbrush in her hand. As an adult she earned degrees in both wildlife ecology and studio art, and she continues to be passionate about art and nature. Currently she works in the botany department at the Arizona-Sonora Desert Museum, pursuing wildlife art as her other career.